Keeping the Pounds Off! : Buffet Madness? 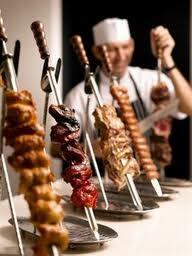 This week my husband and I went to a churrascaria restaurant. This is one of those Brazilian dining places where they bring around meat on skewers and you take it bits at a time, all you want, while you also feast on sample the many items at the salad and sides buffet. I don't want anyone, including me, to dribble saliva on the keyboard so I will not name each and every dish they offer at this place where we dined. Let's just say this about it: the quality of the food and the quality of the service is worth the $45+ a person price (this is without drinks, wine or dessert). The variety of choices makes it even more enjoyable . . . . or so you might think. I enjoyed my meal. I had meats, salmon, shrimp, soup, salads and vegetables. I ate nothing from my alcoholic-foods list. I was careful with items from my caution list yet I left feeling stuffed. Not sick stuffed, just comfortably full. I skipped the rices, beans, creamed starches and most of the breads. I skipped the cured meats, most cheeses and all sausages. When I have my protein at lunch or dinner it is usually chicken, fish, lamb, pork or beef, never all five, like I did here. When I have vegetables at my meals it is usually two or three, not seven. I usually do not have soup with everything else. I had an ounce or more of each of the meats. Sometimes a bite, sometimes a 2 oz piece. I enjoyed the soup enough to eat the whole bowl. Six hours later I am still not hungry but it is dinner time so I ate a protein bar (oh yeah, like I needed more protein) and had a diet soda. My mind is thinking about tomorrow's food and I am having trouble narrowing down the selection of what to have for my meals. My taste buds are alive with the flavors of all the many things I tried today. They have been awaken from their slumber and they want more. Still not really hungry, my mouth has started watering for something sweet. I realize what is going on. I know this will pass. My past experience has taught me that not every meal has to be a party in my mouth. I can just repeat the day's meals I ate two days ago and I will be fine; the taste buds will quiet back down again. Even though I ate nothing that I cannot eat sanely, I did have so many different flavors it activated the abnormal behavior in my head to start wanting for the sake of wanting. Not needing - just wanting. It is good to recognize this reaction to the food. It is good to equate this with the marketing-reasoning behind all the glutamates Doritos puts in their nacho chops. Their many, many flavor enhancers cause people's taste buds to want more, more, more. It makes me happy that I have identified for myself yet another eating/food behavior that wants to work against keeping the pounds off. It will help me make sense of my cravings and reactions anytime we go out to eat at such places. This will come in handy on our next cruise because cruises are places where buffets are a daily thing. You know what is funny? On cruises I always want to eat at the sit down restaurants and my husband wants the buffets. It is good to know that my natural instinct is trying to direct me to the safer dining room. I think I will listen it that natural instinct a little more. Oddly (maybe), the Brazilian Grill in Hyannis on Cape Cod is one of my top choices for a dinner out (I think ours is $29 for adults, not incl. beverage/dessert) because the meat is top quality and I have learned not to pig out at the buffet because I want to save room for all the amazing different cuts of steak! Buffets aren't one of my problems (although I'm sure in my past life I would have been one of the typical "I'm getting ALL I CAN for my $29!" people who stuff down plate after plate of whatever's on it). I get some salad greens, sometimes some of the pickled veggie offerings, the shrimp, the oysters, a couple of pieces of sushi and that's more than enough. I never go up again, I just enjoy all the meats and I usually do get a dessert because they're excellent and made on the premises -- and again, dessert in a restaurant occasionally is a non-issue because it's not like I'm going to eat my lava cake and then go find our waiter and ask for another one; very different than having a half gallon of ice cream or a whole cake or a dozen cupcakes in the house where I could eat them without being seen. We've been there probably five times in the past 18 months and, much like a hibachi restaurant, it's as much entertainment as it is a meal. We have a lot of Brazilian friends and I love their style of cooking and I feel like I actually have *more* control over how much I eat at this place than I do with a traditional plated entree, as I can flip my card over to "Nao Obrigodo" if I'm feeling full and call it a night, I guess. Anyway, as an occasional night out, I think it's a good value and a fun place to go with a group; the kids absolutely love it (they love chicken hearts, of all things!) and it's a protein-lover's dream come true...unlimited perfectly rare beef brought to your table on swords by men in costumes? :) Can't beat it! Very good post. I think the taste bud thing is very real and little understood. Curious how your diet pop fits into your taste bud thing, it obviously does not trigger you or you would not drink it, but how does that react with setting up taste bud expectations -? I love this! I have also discovered that if I veer off into "party in my mouth" territory that it makes me want more and more. I sometimes see other bloggers who are eating so well and then a friend(?) or their husband will bring them their most favorite, decadent, huge cupcake (or other sweet)which they seem obligated to eat. It usually sends them spiraling off into wanting more, more, more. For days afterward they eat all kinds of junk and keep saying "Why am I doing this?" Sad.